Anthony’s Pro Auto is an automobile care business that specializes in automotive maintenance and repair. We provide lubrication services (oil and filter change) with concierge service, vehicle repair and maintenance, alignment, specialized repairs, and rock chip windshield repairs. Anthony’s Pro Auto is located at 1839 Dublin Blvd. Colorado Springs, Colorado 80918. We offer Concierge Car Care. Our professional staff will help to keep you and your vehicle safely on the road. 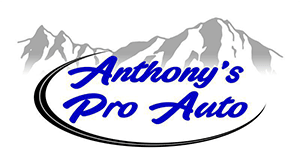 Anthony’s Pro Auto treats your car or truck as a valuable asset, and our customers with respect. We are a family owned shop with the experience and expertise to provide professional personalized service. Anthony’s Pro Auto's technologically savvy ownership, state of the art equipment, attention to every detail, cleanliness of our waiting room, free Wi-Fi, and concierge level of service differentiates us from our competitors. We will use state of the art trustworthy industry pricing solutions to quote our personalized services to our customers.